This entry was posted in Austria Immigration and tagged Austria EU blue card austria red white red card Austria tourist visa from India on July 11, 2016 by Blog Author. Austria’s mixed blend of spectacular landscapes and urban centers that create a new visual world in the minds of travelers. 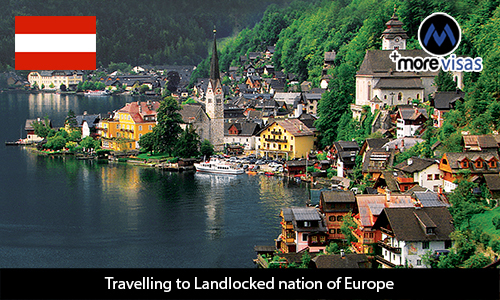 Popularly known as the landlocked nation is in the central Europe, shares boundaries with Switzerland and Liechtenstein to the west, Hungary and Slovakia to the east, Czech Republic and Germany in the north, Slovenia and Italy to the south. Austria is surrounded by land on all the sides without any exposure to Mediterranean Sea. This highly mountainous nation has the stunning medieval age Hofburg palace in Vienna was ruled by Emperor Joseph-2 and now it is the home of president’s state business. The palace showcases the architectural styles of medieval age that include Renaissance, Gothic, Baroque, Classicism and Rococo. St Anton am Arlberg famous Sky Resort, Innsbruck Altstadt surrounded by Alpine mountains, the medieval age magnificent Salzburg castle, Vienna State Opera are some of the most visited places in Austria. These places will fill your memory with new experience and allows you to explore new things while highlighting the geographical prominence of being land locked. People who visit Austria can avail the facility of Schengen visa, and can visit 25 other countries of Europe which are part of the Schengen agreement. Schengen visa is granted for a period of three months, if travelers prefer visiting all the popular destinations, then it would be amazing experience as Schengen covers countries of almost the whole Europe continent.